Just days after Johnson & Johnson's (JNJ) Children's Tylenol started returning to pharmacies' shelves, the health care giant recalled about 4 million packages of Children's Benadryl allergy tablets and some 800,000 bottles of Junior Strength Motrin, citing manufacturing problems. More than 135 million bottles of over 40 Johnson & Johnson's over-the-counter children's medicines, including liquid versions of Tylenol, Motrin, Zyrtec and Benadryl, were recalled in late April because of manufacturing deficiencies. The recalls, which began a year earlier, culminated when the Food and Drug Administration stepped in. The agency investigated, then wrote a horrific report about the manufacturing conditions and processes at Johnson & Johnson's McNeil Consumer Healthcare Unit, after which the company suspended manufacturing at its plant in Fort Washington, Pa. The recalls were the subject of two Senate investigations, and the Oversight Committee hearings revealed cover-ups and phantom recalls. The recalls have tarnished the company's reputation and hurt its financial results: Sales in its consumer healthcare unit declined a whopping 25% in the last quarter. Last month, the company began shipping its children's products again, with 1 million bottles of the grape-flavored version of Children's Tylenol headed to U.S. pharmacies and retailers, and other recalled medicines scheduled to return to store shelves through the middle of next year. But many questioned whether parents will be buying them. If Johnson & Johnson could have made a convincing case to the public that its problems were temporary and had been dealt with, consumers might have slowly returned to buying its branded children's medicines, but with these new recalls hitting so soon after the McNeil unit resumed shipments, that optimistic outcome is seeming less likely. The New Brunswick, N.J., drugmaker said in its Nov. 15 announcement that the new recall "is a wholesale and retail level recall. No action is required by consumers or healthcare providers and consumers can continue to use the product." So why the recall? Following the FDA investigation earlier this year, McNeil had to conduct and submit a Comprehensive Action Plan, which revealed "insufficiencies in the development of the manufacturing process." McNeil added, "There is no indication that the recalled products do not meet quality standards, and this recall is not being undertaken on the basis of adverse events." 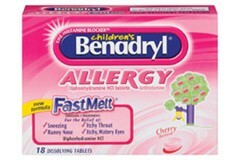 The products recalled are: Children's Benadryl Allergy Fastmelt Tablets, in cherry and grape flavors, that were distributed in the U.S., Canada, Belize, Barbados, Puerto Rico, St. Martin and St. Thomas; and Junior Strength Motrin Caplets, 24-count, distributed in the U.S.